Fig.1: Thiamina or Vitamin B1 is a colorless organosulfur compound with a chemical formula C12H17N4OS. Its structure consists of aminopyrimidine and athiazole ring linked by a methylene bridge. The IUPAC name is 2-[3-[(4-Amino-2-methyl-pyrimidin-5-yl)methyl]-4-methyl-thiazol-5-yl] ethanol. Thiamine (Fig.1) is an essential water-soluble vitamin of the B complex, that involves other seven essential B vitamins that help the body to convert food (carbohydrates, fat and protein) into energy; it plays an important role in cellular production of energy from ingested food and enhances normal neuronal actives. The only type of rice that contains vitamin B1 is brown rice, as opposite to polished, white, or de-husked rice, that has its husk removed in order to extend its lifespan, but also has the unintended side-effect of removing the primary source of thiamine. There are several thiamine-deficiency related conditions, which may occur concurrently, including Wernicke's encephalopathy, Korsakoff's syndrome and Wernicke-Korsakoff syndrome and Beriberi, it can affect the central and peripheral nervous systems (dry beriberi) or the cardiovascular system (wet beriberi). 1. Pentose phosphate pathway: it occurs in the cytosol of human cells; one of the most important enzyme in this pathway is Transketolase that requires thiamine as a cofactor, modifying a molecule called glucose-6-phosphate, which is derived from glucose. This leads to the production of two important compounds: ribose-5-phosphate and reduced nicotinamide adenine dinucleotide phosphate (NADPH). 2. Kreb’s cicle: this pathway generates a molecule called adenosine triphosphate (ATP). There are two main enzymes, pyruvate dehydrogenase complex (PDH) and alpha-ketoglutarate dehydrogenase (alpha-KGDH) that require thiamine as a cofactor in the Kreb’s cycle. The thiamine deficiency can result from conditions that restrict eating, such as orofacial cancers, or limited by vitamin absorption: causes of bad absorption are gastrectomy, gastric and colon cancer, hyperemesis gravidarum, starvation by choice (anorexia) or associated with sepsis, surgical complications, and coma. By far the most common cause of thiamine deficiency throughout the world is alcoholism: alcohol inhibits the rate-limiting step by interfering with intestinal ATPase involved in the absorption of thiamine; a heavy drinker has not a correct absorption of vitamin B1 despite of a well-balanced diet. Ethanol disrupts the thiamine storage in the liver and inhibits the transformation of the thiamine into its active form. The Thiamine deficiency leads to several effects on the central nervous system, the foremost neurological complication is the Wernicke-Korsakoff syndrome (WKS) that is a combined manifestation of two namesake disorders: Wernicke's encephalopathy and Korsakoff's psychosis; these were named after Carl Wernicke– a German phisician, anatomist and neuropatologist of second half of the XIX century- and Sergei Korsakoff– a Russian neuropsychiatrist of the same period- respectively. The aforementioned changes in mental state occur in approximately 82% of patients, the most common symptoms are confusion, apathy, inability to concentrate and a decrease in awareness of the immediate situation they are in. In about 29% of patients ocular disturbances consist of nystagmus and paralysis of the lateral rectus muscles or other muscles in the eye (symptoms that have been described as a hallmark of the disorder). A few of these patients present a decrease in the reaction time of the pupils to light stimuli; in worst prognosis ocular disease may be followed by retinal haemorrhage. Finally, the symptoms involving stance and gait occur in about 23% of patients and result from dysfunction in the cerebellum and vestibular system. Other symptoms that have been presented in cases of WE are stupor, low blood pressure (hypotension), elevated heart rate (tachycardia), as well as hypothermia, epileptic seizures and a progressive loss of hearing? However, only 15% to 30% of patients present the complete WE triad. If left untreated, WE could lead to coma or death. • Apathy (the patients lose interest in things quickly and generally appear indifferent to change). Anterograde amnesia is a loss of the ability to create new memories after the event that caused the amnesia, unlike retrograde amnesia (RA) that is a loss of memory-access to events that occurred, or information that was learned, before an injury or the onset of a disease. Confabulation is a topic of this syndrome: it represents a memory disturbance, defined as the production of fabricated, distorted or misinterpreted memories without the conscious intention to deceive. Confabulation is distinguished from lying as there is no intent to deceive and the person is unaware the information is false. Although individuals can present false information, confabulation can also seem to be coherent, internally consistent, and relatively normal. Individuals who confabulate present incorrect memories ranging from "subtle alternations to bizarre fabrications", and are generally very confident about their recollections, despite contradictory evidence. Other causes of confabulation, in addiction to alcoholism, are aneurysm or Alzheimer's disease that occur after brain damage. Fig.3: Axial MRI FLAIR image showing hyperintense signal in the mesial dorsal thalami, a common finding in Wernicke encephalopathy. This patient was nearly in coma when IV thiamine was started, he responded moderately well but was left with some Korsakoff type deficits. The Wernicke–Korsakoff syndrome (WKS) –also called wet brain, Korsakoff's psychosis, and alcoholic encephalopathy- involves an acute Wernicke-encephalopathy phase, followed by the development of a chronic Korsakoff's syndrome phase. Disorders related to the presence of WKS include the signs of WE and those of KS. In Europe and USA, the most common cause of this syndrome is related to nutritional deficiency caused by alcoholism. The WKS is even more under-recognized among malnourished patients who have psychiatric disorders, but do not abuse alcohol or suffer from anorexia nervosa. 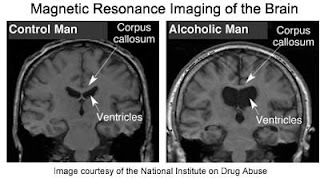 In particular, long-term chronic ethanol abuse results in hippocampal and cortical cell loss. The thiamine deficiency also alters principally hippocampal and frontal cortical-dependent neurochemistry; moreover in WKS patients, important pathological damage to the diencephalon can occur. In fact, the amnesic syndrome typical for the WKS is mainly due to the damage in the encephalic-hippocampal circuitry, including thalamic nuclei and mammillary bodies. The unavailability of acetilCoA due to lack of TPP (coenzyme of the pyruvate dehydrogenase) leads to missed production of acetylcholine. The loss of cholinergic cells in the basal forebrain region results in decreased cholinergic input to the hippocampus and to the cortex and reduced choline acetyltransferase (CAT) and acetylcholinesterase activities and function. 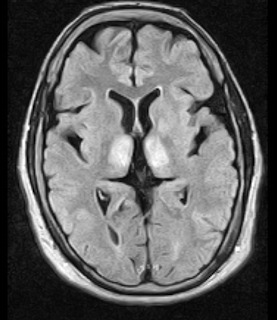 The amnesia that is associated with this syndrome is a result of the atrophy in the structures of the diencephalon (thalamus, hypothalamus and mammillary bodies), and is similar to amnesia, that is presented as a result of other cases of damage to the medial temporal lobe. It has been argued that the memory impairments can occur as a results of damage along any part of the mammillo-thalamic tract, which explains how the WKS can develop in patients with damage exclusively to either the thalamus or the mammillary bodies. The role of alcohol consumption in the development of WKS has been experimentally confirmed through studies in which rats were subjected to alcohol exposure and lower levels of thiamine through a low-thiamine diet. The studies have demonstrated that clinical signs of the neurological problems, that result from thiamine deficiency, develop faster in rats that have received alcohol and were also deficient in thiamine than in rats who did not receive alcohol. In another study, it was found that rats that were chronically fed with alcohol had significantly lower liver thiamine stores than control rats. Among paraclinical studies, magnetic resonance imaging (MRI) is currently considered the most valuable method to confirm a diagnosis of WE. MRI has a sensitivity of only 53%, but its high specificity of 93% means that it can be used to rule out the disorder. MRI studies typically show an increased T2 signal, bilaterally symmetrical, in the paraventricular regions of the thalamus, the hypothalamus, mammillary bodies, the periaqueductal region, the floor of the fourth ventricle, and midline cerebellum. Disruption of the BBB (blood brain barrier) has been seen in these regions in 6 of the 12 patients studied with contrastenhanced computed tomography (CT) or MRI scans. Importantly, the typical pattern of lesions on an MRI is observed in only 58 percent of patients. The treatment of clinical manifestations of thiamine deficiency, especially WE, should be started immediately, either intravenously or intramuscularly, to ensure adequate absorption. The treatment must be different for patients with the disorder and those at risk of developing it. Specifically, patients who have signs indicative of WE should be treated empirically with a minimum of 500mg of thiamine hydrochloride per 100mL of normal saline, given by infusion over a period of 30 minutes, three times per day for 2 to 3 days. In cases where there is no response, supplementation may be discontinued after 2 to 3 days. In cases where an effective response is observed, the treatment should be continued. When patients with WE are inappropriately treated with low doses of thiamine, the biochemical abnormalities caused by the thiamine deficiency can lead to irreversible brain damage and death. Recent data from a controlled study into the therapeutic benefits of thiamine in alcohol-dependent patients without clinically apparent WE, show that at least 200mg of parenteral thiamine may be required to improve neurological symptoms. The changes in mental status have shown to improve after 2 to 3 weeks of therapy. In contrast to WE for KS, it is not possible administer a drug treatment because the disease is at the stage of neuronal injury that involves the thalamus, hippocampus and mammillary bodies. Despite in some cases the treatments are possible, a great majority of patients with Wernicke-Korsakoff syndrome are never recognized. Up to 80% are found on postmortem examination of the brain, only more or less 20% of cases are diagnosed clinically. In fact prevalence of WE lesions have seen on autopsy and this has also shown that in alcohol abusers the lesions are generally most prevalent than in those individuals who do not abuse alcohol. (Fig.4) However, additional studies are required to explain the predilection of selective brain structures due to thiamine deficiency. Fig. 4: MRI in alcohol abusers in opposition to control man.